It can be difficult to leave luxuries behind. Fortunately, in some cases, you don’t have to. There are often alternates to those nice things. I’ve already written about how many things a sarong can do. Here are some more of my substitutes. My goal is to take up very little space and weight. But don’t worry: I am not going to tell you to cut a neck and arm holes in a plastic garbage bag to make a rain coat. I also prefer natural or healthy. I hope to be able to attend Natural Products ExpoWest March 2017 to find some great solutions for us all. Especially products that do double or triple duty. Some of these are actually you-don’t-have-to-pack-anything-tips so it really save space. This youth toothbrush isn’t so good at this. I have read that a silver or copper tongue scraper is best because they have anti-bacterial properties.but these will do the job while you’re on the road. Your very own teeth! 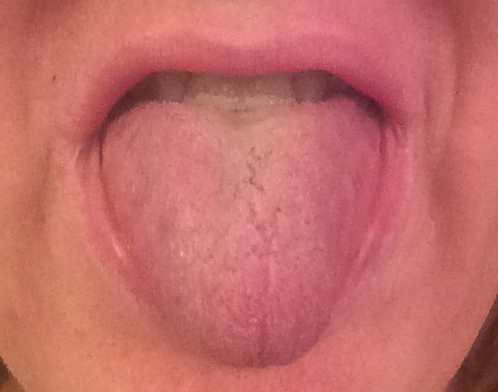 Simply stick out your tongue and push it against the front of your top teeth. Then pull your tongue back into your mouth scraping it against those teeth. Spit, rinse. Repeat until you feel cleaner. The great thing is that you can do this anywhere (except in a room with other people). Use dental floss against your tongue. This is more difficult and I don’t think does as good a job. I have already written about how helpful a sleep mask can be while you’re away from home and can’t hang your own blackout drapes etc. (See Pack a sleep mask — my choice is Nidra mask.) But what if you don’t have one — yet. Or you’ve lost yours. Put a tank top or tee-shirt over your eyes. Fold it so it only covers your eyes, not your mouth! 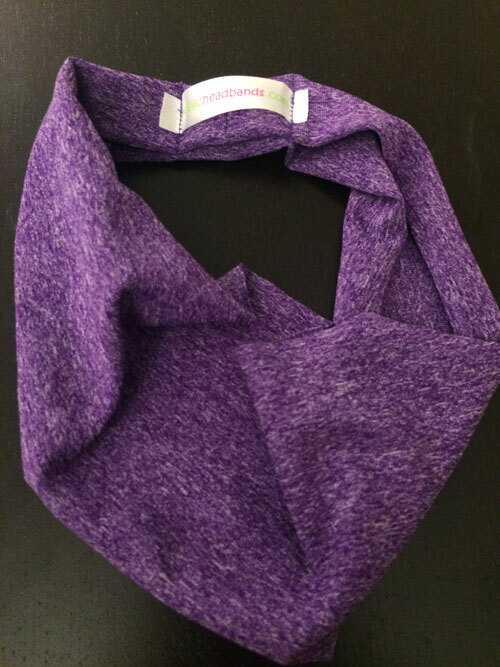 Wrap it loosely around your head, tucking it under the back of your head so it’ll stay in place. I find this works, staying in place fairly well even when I roll over. A wide headband if you carry one. I like my Fit Chic Headbands and they’re a good width for this. It’ll be closer to your eyes than a very comfy Nidra mask, but it’ll get the light out of your eyes. (Well the thicker fabric ones are.) By the way, that headband will also come in handy for anyone with long hair — to hold it back when washing your face. I discovered this when I was in hot, sticky Central America during their summer. To save space, I’d given up my little container of baby powder. I’d get out of the shower, towel off and immediately be so sticky that my (sorry guys) bra stuck to me making it hard to get dress. One day as I shopped for groceries, I hit upon my own solution. 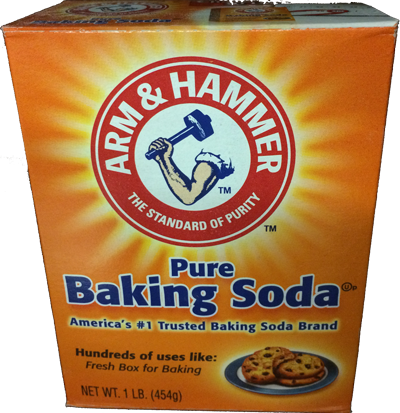 Baking soda does the job to cool your skin and keep your undergarments from sticking to you. It’s almost always available because it is sold in pretty much every food market in every country. It’s inexpensive so you can use it, then give it away – or pour it down the sinks and toilets where you’re staying so it can get them smelling fresh. Since the year I started this substitution, the word is that talc is bad for us and I have noticed that baking soda is listed as a substitute. I like seeing my trick endorsed. Granted toothpaste isn’t really a luxury, but there may come a time when you need a substitute. Baking soda. (Again.) 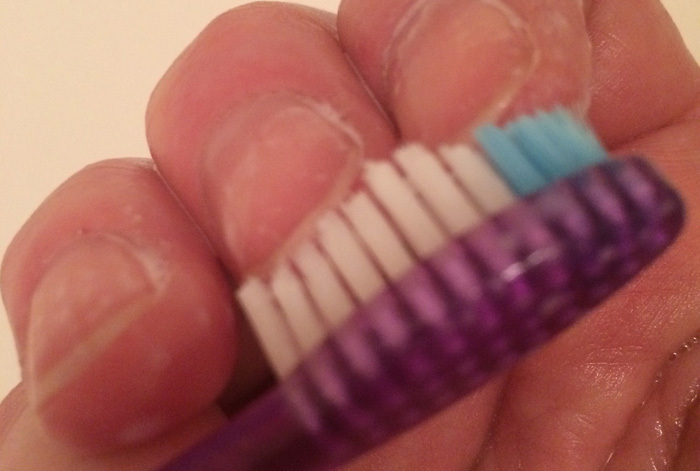 Wet your toothbrush then tap a bit out of the box (or your container if you’re carrying some). It’ll stick to the brush just enough for you to get it into your mouth. Don’t brush too hard. 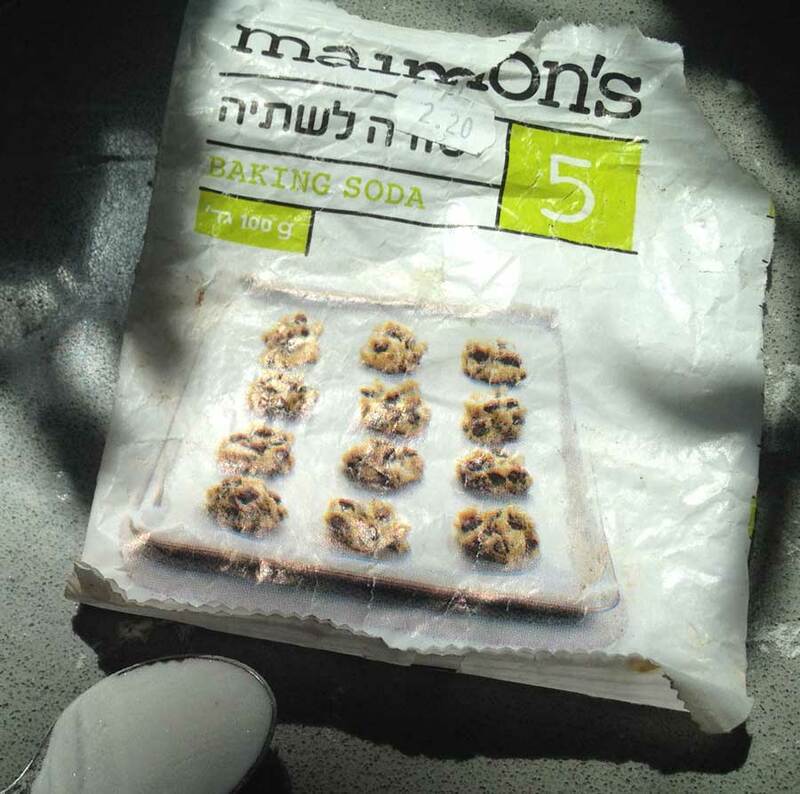 Baking soda, as I mentioned, is inexpensive and available in food markets in every country I’ve been to. It also helps remove stains from your teeth. Do you have oily skin and like to use fancy blotters to remove that extra oil from your face? If so, you can pass on packing that luxury item. Instead of packing yet another bottle you might use what’s in the kitchens where you stay. Each is actually said to be better than any commercial moisturizer and to have true health benefits. I don’t recommend packing any of them, though. If you have a favorite moisturizer and feel safe bringing it, pack some into a small container. (I recommend Brincatti containers if you feel you need 3 ounces or a bit less. I also respect Kenny Brincat and love that this is a family business.) That way you have it when none of these oils are on hand. Olive oil. Again, I wouldn’t pack and travel with it, but it’s in many a kitchen. It’s great for hands, elbows, and ankles. My cosmetic-surgeon-student friend says it’s not as good as coconut oil, but it’s been used for centuries in Mediterranean climates and Israel. Grapeseed Oil. It’s good too, per this ABC News story. Sunflower Oil is also good for your skin per the same ABC News article. The source for that story says it’s just as good for your skin as olive oil and is also good as a massage oil. It feels so nice to have well-manicured, shiny nails — but a glass jar of nail polish is a major risk to your belongings. Plus, it requires nail polish remover. And polish requires maintenance. I do recommend carrying an antibiotic ointment but you may not always have it on you. Garlic! Yes, really. I have seen people cut into a clove of fresh garlic and rub in on skin to fend off infection from cuts. It was also used on my friend’s bee sting (or something-sting) when he was stung at Petra. He doesn’t recall fully, but he thinks they mixed garlic and salt, then rubbed it on the sting. Next thing he knew he wasn’t bothered by it anymore, and he’d been dizzy from that sting. A normal sized cold cup. 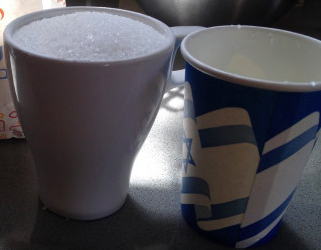 A normal sized coffee mug. A normal sized styrofoam cup. This is the size of a Keurig coffee maker “medium” cup in case that helps. If you tend to need Antiacid for Indigestion or Heartburn, I don’t suggest you travel without it, but you can get away with carrying less. Believe me, if you travel in Central America, butter will become a luxury item. I’m sure the same holds elsewhere. Interestingly, there is a substitute — to carrying around sticks or tubs of butter, that is. Butter Buds is actually dried butter that comes in 2-gram packets — and I was lucky enough to be given some for my travels. 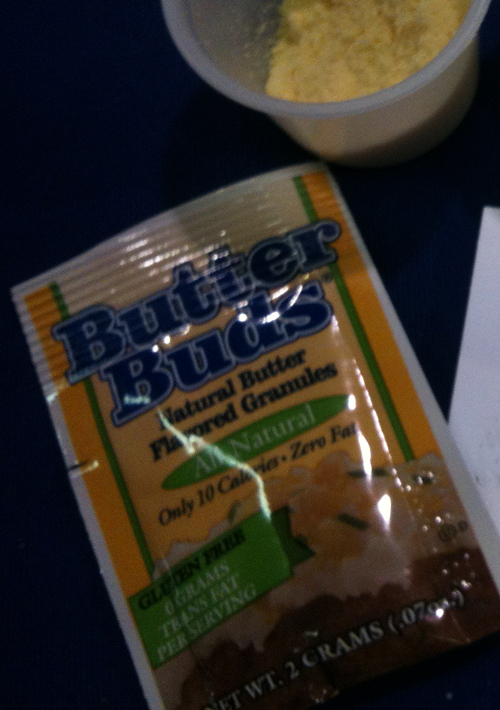 (A Natural Products ExpoWest find.) You can stir ½oz into 4oz of warm water or use it dry. There is a coupon on their website. It seems Butter Buds seem to be more available on the east coast but are listed as sold at Walmart in California. Here’s a store locator. If you tear off the top of a box of baking soda and keep it in the back of a refrigerator, it will absorb odors. Which makes me think, Bart… On days when you aren’t actively moving between locations, you could use some in your travel bag to freshen it up. You’d need to put some in a partly open container and arrange it so it won’t spill. Who knew there were so many uses for baking soda! I am definitely packing some with me on my next trip. Thanks for sharing such helpful tips!